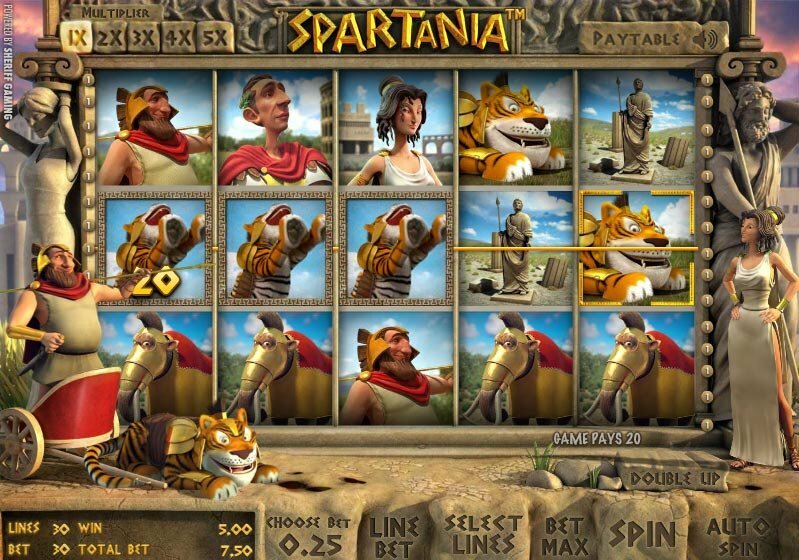 Play online slots with the citizens of Ancient Sparta! The Spartania Slot Game offers terrifically designed 3D graphics along with an epic amount of bonuses and fun features. With so many chances to win big cash prizes, you may soon be wining and dining like a Greek God! Powered by B3W, the Spartania online slot from Sheriff Gaming has it all. This 5-reel, 30-payline video slot comes complete with excellent quality graphics and plenty of bonus features. Win big, have fun, and enjoy the legendary Spartan society right from your computer. The first thing I noticed about the Spartania slot game was the stand-out, crystal clear music and sound effects. In the background, you can hear the sounds you would expect walking along the busy streets of Sparta. Listen for the roaring lions, snapping of whips, beating of drums, swords clashing, the strumming of a Greek guitar, and the hum of a noisy crowd. The soundtrack perfectly mimics the Ancient Greek theme. Now on to the actual graphics which I must say, look amazing. The 3D images include tigers, elephants, armor, statues, arenas, and Greek citizens dressed in robes. During winning combinations the images animate and pop up out of the reels. 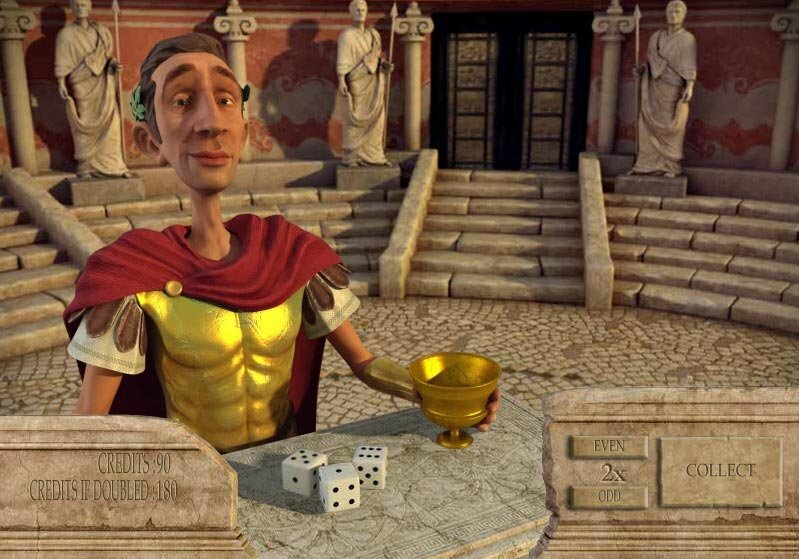 The realistic graphics during the Double Up Bonus Round included a Spartan man sitting at a table with dice and a chalice. You can tell the graphic designers really focused on details. He even blinks and moves his eyes! 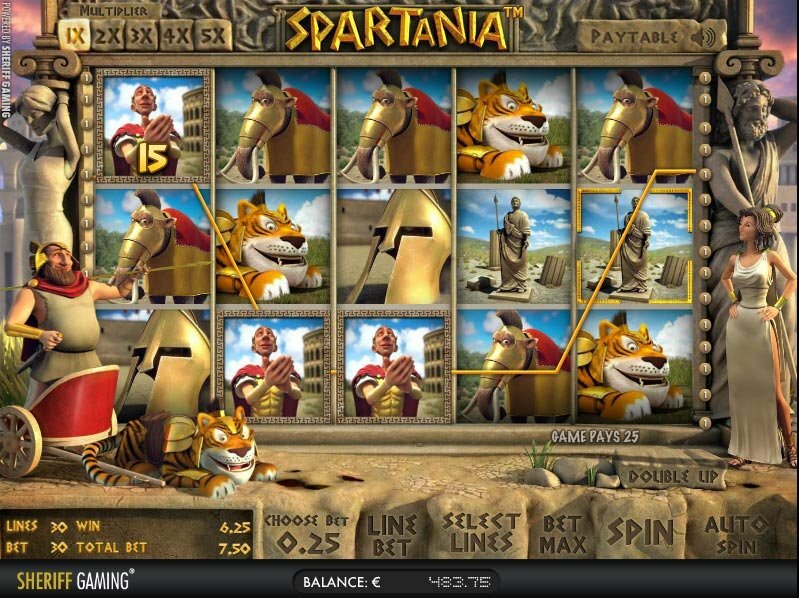 Spartania Slot Machine Provides Greek Flavor With Fun Play. Even better! – the Spartania online slot from Sheriff Gaming does not require any software download and can be played in a real-time Flash version. The game did freeze up from time to time, but this does tend to be the case when playing a Flash game. Here’s a game that sets the bar for features. The Spartania slot bonuses go above and beyond your standard must-haves in slot machines to include lots of lucrative bonuses. With so many bonus features, it’s difficult not to win big playing Spartania. Keep an eye out for the sword and shield which represent the Expanding Wild symbol. The Expanding Wild spreads across to make an entire reel wild, giving you more chances at getting winning combinations. The game also contains a multiplier, which players receive randomly at the beginning of every spin. The multiplier applies to all of the prizes won during that spin, including feature bonus game winnings. The Spin symbol appearing in the center position triggers the Wheel of Fortune Bonus Round. The prize during the Wheel of Fortune round will multiply by the number of active win lines and by the active line bet. However, the Spin symbol only appears on the 5th reel. 3 scatter symbols will activate the Bonus Round. In this special round, the Roman warrior lays out coins on the table. You then must choose a coin which the warrior will turn over to reveal the prize hidden underneath. Each coin hides a different number of points. Keep playing to win until you see the word “Collect”. Now the multiplier awarded on the spin before entering the bonus round will apply to the total points won during the bonus. Players can also access Spartania’s Double Up Round after winning a prize. Click on the Double Up button to launch the game. During the game, you must guess whether the sum of the dice will turn out even or odd.